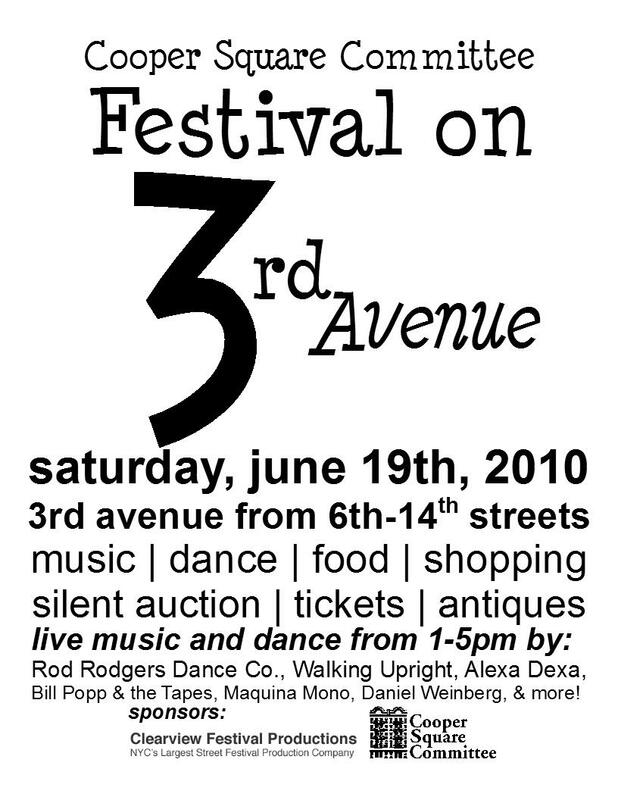 The Cooper Square Committee is holding our annual 3rd Avenue Festival (6th St. to 14th St.) on Saturday, June 19th, 10 am to 6 pm. There will be live performances from 1 – 5 pm, including the Rod Rodgers Dance Company, Maquina Mono, Alexa Dexa, Walking Upright, Bill Popp and the Tapes, and Daniel Weinberg. If you can contribute an item to our Silent Auction (a service, dinner for two, tickets to a show, etc…), please contact Steve or Daniel at 212-228-8210. We will list you in our Program Booklet that will be handed out at the Festival.